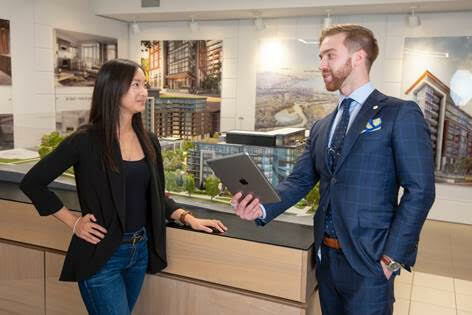 VANDYK and Salefish Software - A Natural Fit - Salefish Inc.
MISSISSAUGA, ON – When VANDYK Group of Companies was preparing to launch Backyard Neighbourhood Condos in South Etobicoke in 2016, management searched for a software solution that would streamline their sales and documentation process. After intensive research they implemented Salefish, a cloud-based point-of-sale (POS) real estate software created by Rob Nicolucci and Rick Haws of RN Design in Vaughan, ON. In fact, people of all demographics find the program intuitive and are happy to have so much up-to-the-minute information at their fingertips. Sales representatives say that once purchasers have browsed their choices and made a decision, they can have a printed or digital Agreement of Purchase and Sale within a few minutes. “This level of flexibility, customization and service provide us with a competitive advantage in the marketplace,” reiterates Matysiak.